Fans are encouraged to arrive early, ALL fans 16 and older must present a valid ID to enter West Point. Fans attending the game WITHOUT* an advance parking pass, must enter through Washington Gate (917 Washington Road, West Point, NY). 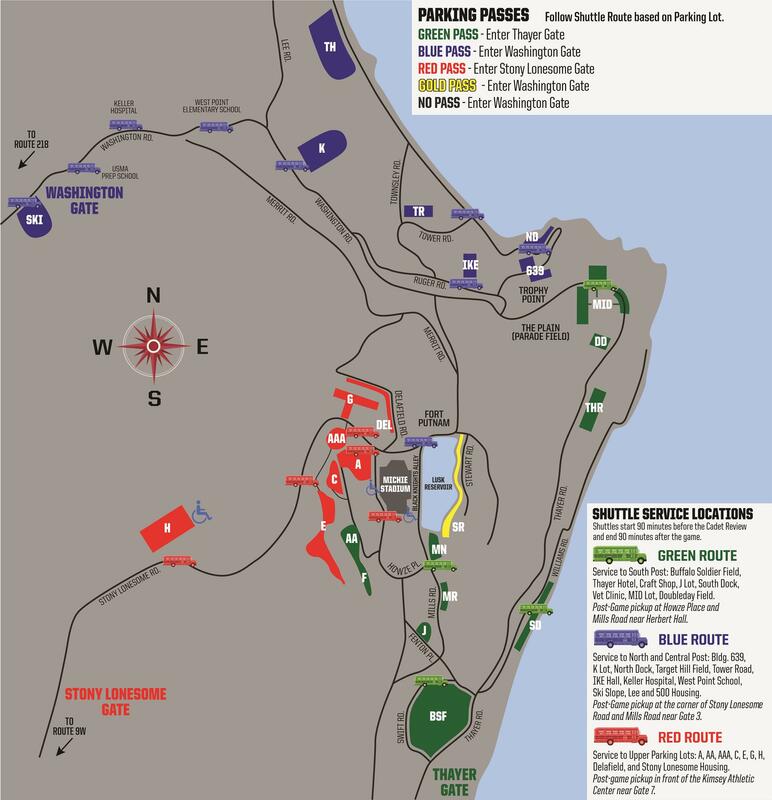 *ADA and wheelchair accessible parking and bus transportation is available by entering Stony Lonesome Gate and parking in H Lot. Fans requiring this assistance DO NOT need an advance parking pass for parking in H Lot. H Lot is available for transportation to the parade ground and to Gate 1 and Gate 5 of Michie Stadium (1 Stony Lonesome Road, West Point, NY). PARKING LOTS: Open at 6:00am - Gameday (non-reserved) general parking MUST enter through WASHINGTON GATE. See below for full parking information. TRAFFIC CLOSURE: Because of the homecoming wreath laying ceremony, traffic will be shut down at the corners of Washington Road/Stony Lonesome Road, Howard Road/Ruger Road, GC Building and Arvin starting at 8:10 AM until the ceremony is complete at about 8:40 AM. During this time, traffic will be completely halted in all directions. Please plan accordingly. TICKET WINDOWS OPEN: Day of game and the pre-paid ticket will call windows open at 9:30am. The pre-paid ticket window is located at the ticket office at Gate 3 of Michie Stadium. This window is for fans that have purchased tickets within 10 days prior to the game, or have made other arrangements in advance. STADIUM GATES: Open at 10:00am. TRAFFIC UPDATES: Tune into 1260-AM WBNR and 1420-AM WLNA for West Point traffic updates every 30 minutes starting at 10:00am. GUEST ASSIST: By using the Guest Assist Text System, you can ask questions about security, traffic, parking, guest service tent locations, and more. You can also report issues, concerns, and emergencies. Text the word KNIGHTS to 78247. TWITTER UPDATES: Follow @ArmyGameDay (for live updates on traffic, parking & shuttles) and @ArmyWP_Football on Twitter for live game updates and information. This week's game hashtag is #MIOHvsARMY. RADIO: WBNR 1260 AM (Beacon, N.Y.), 1420 AM WLNA (Peekskill, N.Y.) 570 AM (New York, N.Y.) SIRIUS Satellite Radio Channel: 137; XM Channel: 202; SIRIUS Internet Channel: 967. Tunein App (free) through Apple or Google. 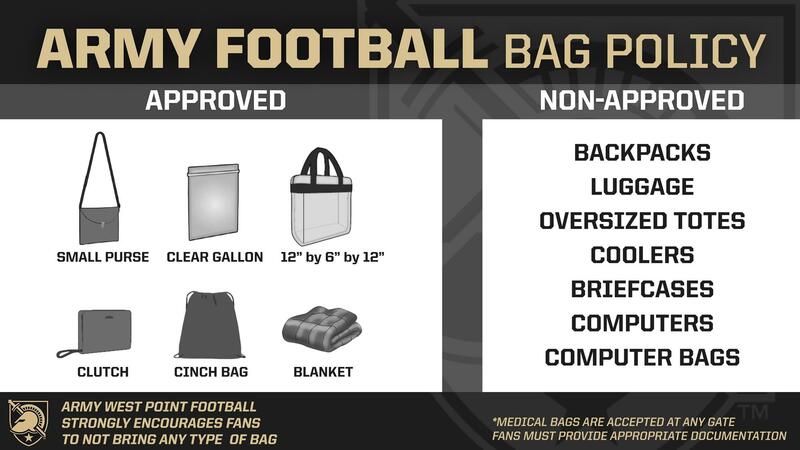 In order to increase safety and security measures, a bag policy for Michie Stadium is now in effect, mirroring policies enacted by the NFL and many other collegiate venues. Items that will not be permitted include backpacks, luggage, oversized totes, coolers, briefcases, computers, and computer bags. 9:00am - CADET REVIEW: One of the time honored traditions of a West Point gameday, a full-dress cadet parade takes place on “The Plain” three hours prior to kickoff (weather permitting) for every home game. 9:00am - BLACK KNIGHTS ALLEY OPENS: Black Knights Alley is the fan fest that runs along Mills Road, between Michie Stadium and Lusk Reservoir, featuring live music, inflatables for kids, food and beverage, face painting, interactive sports, tailgate show, and more. Teams scheduled to appear: Men’s Tennis & Women’s Lacrosse. 9:50am - BLACK KNIGHTS WALK: The football players, Rabble Rousers, band and coaches will walk from Gate 3 of Michie Stadium down to the locker room. Line up along Black Knights Alley to cheer on the Black Knights as they enter the stadium for gameday. 11:35am - CADET MARCH-ON/NATIONAL ANTHEM: Approximately 30 minutes before kickoff, a Cadet Regiment marches on the field, and the USMA Band performs the National Anthem. 11:45am - PARACHUTE DEMONSTRATION: A fan favorite, look skyward as West Point Cadets jump from a helicopter and land minutes later on the field as they parachute in the official game ball approximately 15 minutes before kickoff (weather permitting). 12:00pm - KICKOFF: At 12:00pm, the Black Knights take on the Miami (OH) RedHawks! HALFTIME: The West Point Band takes the field of Michie Stadium to perform. The performance will feature a group near and dear to all West Point Alumni, the Hellcats. The show will open with At the Point, followed by the classic march Bugles and Drums as only the Hellcats can perform. The Hellcats will be on further display with a medley of tunes, including Girl I Left Behind and Yankee Doodle. Let your Facebook friends know you're attending! NOTE: Shuttle bus transportation ends 90 minutes following the completion of the game. General Public (Day of Game Parking) should enter through Washington Gate. For your awareness: Because of the homecoming wreath laying ceremony, traffic will be shut down at the corners of Washington Road/Stony Lonesome Road, Howard Road/Ruger Road, GC Building and Arvin starting at 8:10 AM until the ceremony is complete at approximately 8:40 AM. During this time, traffic will be completely halted in all directions. Please plan accordingly. Highlights from Jeff Monken's weekly press conference previewing the game against Miami (OH).